I've been recently asked a few questions concerning how a lady dresses in my Civil War Reenacting hobby, and I thought now might be a good time to cover that. This particular question will depend on the impression you portray, but for the most part, everything is still the same, just the colors and material change. Let’s start with the basics. These will be according to closeness to skin, so we’ll begin with your ‘unmentionables’, and work our way out! * Drawers made of cotton or linen. - That’s right ladies, as horrifying as it sounds, there was no underwear like we know it today. Drawers, not bloomers, were like linen or cotton pants, which could be as short as the knee, or as long as the ankles, depending on wearer preference. The fancier ones were trimmed with lace. They were tucked beneath the chemise and corset. So what happened when a lady had to relieve herself? There were these inventions called split bloomers, and they are amazing! There is a split that runs from the front to the back, allowing the wearer to use the facilities without becoming completely undressed to do so. Have you ever struggled at a reenactment, trying to use one of those tiny port-a-john’s? It’s hard enough with all the layers and the hoop…trust me, the split bloomers are a God send. I hated them until I tried them, and there is no going back. Plus, they help keep you cooler in the hot summer months. * Chemise (long undershirt) usually made of linen. - Depending on what material this is made from, and the length, it can either be wonderfully cool or insufferably hot. 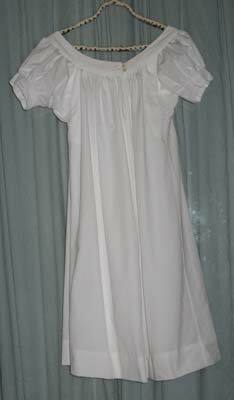 My chemise is made from white cotton, and falls to about mid-calf. It is an off the shoulder chemise, allowing me to use it with everything I wear, not just my everyday bodice, but my ball gowns as well. I sewed in some sheer cotton panels along the side, allowing for some extra breath-ability in the summer. In the winter, I use a heavier chemise. You can either tuck the chemise into your drawers, or allow it to fall freely, and act as an extra privacy petticoat. I prefer the latter. - In all honesty, I have always just used knee high thin wool or cotton socks. But this is because I find those thick striped stocking from Sutlers kind of ugly. I prefer a white or black stocking, not orange, red, green, yellow, or any of the other colors that I have managed to glimpse other reenactresses wearing. 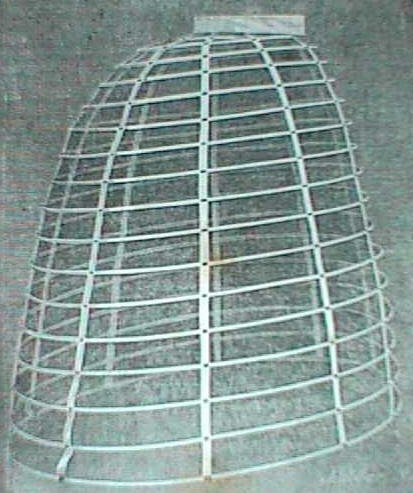 - Don’t worry too much, as most corsets made today have no whale products in them, and instead use steel boning. A good corset should NOT be constraining. 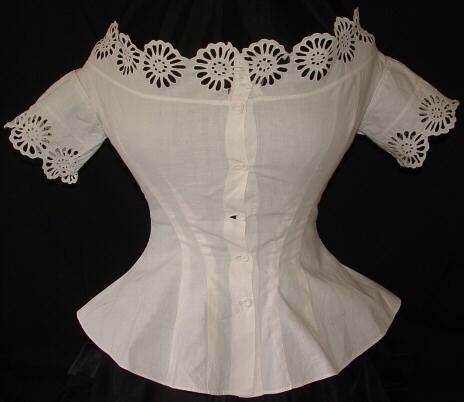 The fashion of making yourself thin with the corset was really started between 1870-1880. During the War years, it was simply used to lift, support, and help manage. And yes ladies, nearly ALL women wore a corset. Working, wealthy, and even pregnant women wore a corset. It was like wearing a bra today; you wore it, or were considered vulgar and loose. 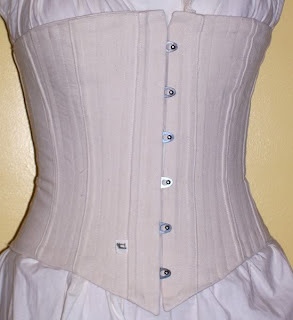 A good quality corset will not pinch or bind, but will actually help straiten the back and ease some of the weight off your chest. It also is an invaluable piece to have, as it supports the weight of all your skirts and petticoats. I would suggest one made from canvas, or a heavier duty material. 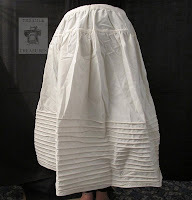 - Now, there is a very strict layering system in place for these garments, and it goes as follows, one or two under, or privacy, petticoats, then the hoop, or corded petticoat, and a couple of other petticoats to put over the hoop, or corded petticoat. 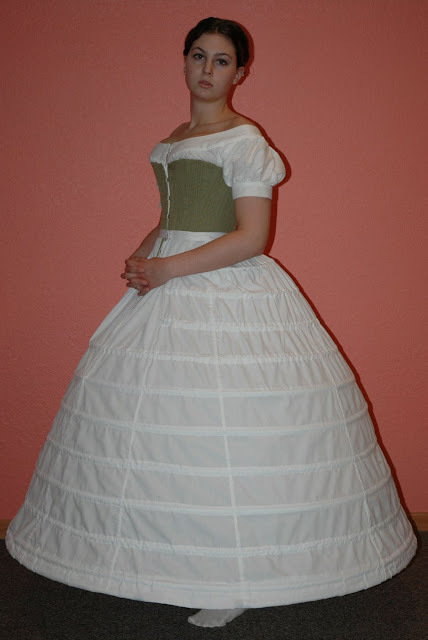 So something like this: petticoat, petticoat, hoop, petticoat, petticoat. Now there are many differences between the three support garments. 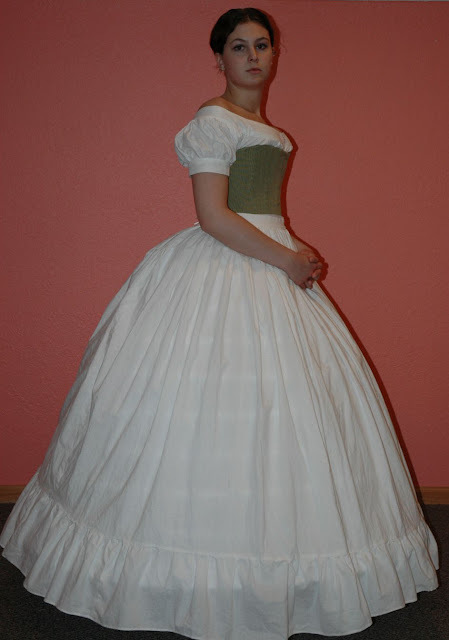 The corded petticoat was fashionable before the 1850’s, when the hoop skirt or cage was invented. It was a skirt, with many rows of thick cord sewn on. For a working class impression, this is a popular option, along with two or three petticoats. 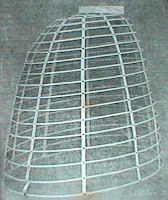 The hoop skirt, or sometimes called a cage, has more support, and allows for a bigger bell shape. This is more common among the upper class or wealthy impressions. 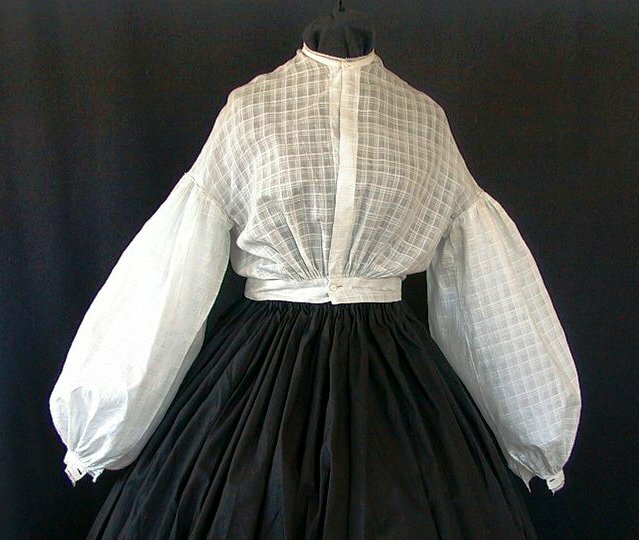 - It was common place among wealth ladies who could afford a sheer dress or garibaldi blouse to wear a corset cover or camisole. This garment was designed to allow a lady her modesty, but completely covering the corset from view. I made my corset cover out of a thrifted blouse. I removed the sleeves, altered the neckline a bit, and voila, a cheap corset cover. These are best made out of cotton, and can be as ornate or as simple as you like. A petticoat is used to keep you both warm, and to support your skirts. By using them, it also wicks moisture away from the skin, allowing for a cooler day. I prefer to use cotton for the summer months, and wool once the weather turns cool. These are VITAL to keeping the appropriate shape, and keeping the dress clean. Without all the undergarments, your body oil will get on the dress, causing stains and dirt...in an era where doing laundry took an entire day, you want to avoid soiling your good dress as much as possible. - The outer clothing, the clothing seen, will depend hugely on your impression. Younger ladies of wealth were the only ones who could wear the much too often seen Garibaldi blouse. It was simply not common for a lady over 30 to wear such a garment. The blouse in question was made from silk, not cotton, and therefore was a sheer and light blouse. - Younger ladies of wealth could afford many different colored fabrics, and often times wore a skirt and bodice of different vivid colors. 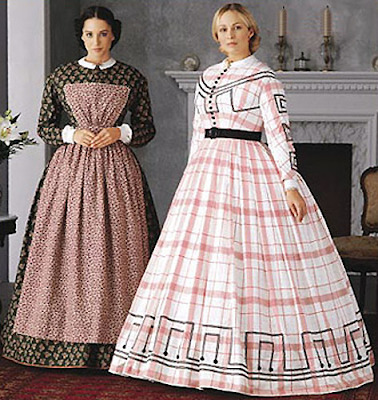 Younger working class ladies wore a simple dress and bodice of the same fabric, and may even have a one piece dress instead of a two piece one. They could wear brighter colors and calicos as well though. Older ladies, 30+, in general wore more muted colors. - The belt was a very common item to be worn, and could be any kind of fabric or leather. Ladies of any age could wear belts, and it was often times used to hang a fan, chatelaine, purse, etc off of. The belt could have a buckle, be tired like a sash, or have a rosette clasp. - Depending on what you’re going to be doing will alter your footwear. I have a few different pairs of boots and slippers just for the differing occasions. Normal footwear for a lady out for a walk would be a simple leather traveling boot, which is ankle high, and laces all the way up. I have these in white, black, and brown. For a riding shoe, these same boots can be worn, but I prefer my knee high leather riding boots. For dances, slippers were more common. Slippers were made of satin, velvet, done in knit, or crochet on the top, and had a hard soled bottom. Some were high heeled, others were flat. - No matter what, you need to have some kind of wrap on. Be it a simple crochet shawl, a lace shawl, or a full on jacket. If you were outside, you had a wrap on. I use a peletot jacket I made for all my impressions, since it was useful in almost all situations. 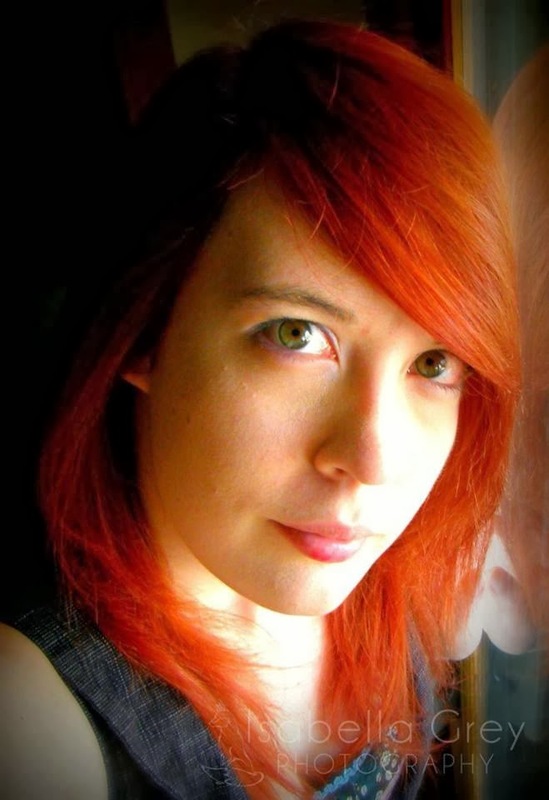 - No polite lady showed her bare flesh in public, and that included the hands. If you’re outside, you should be wearing wrist length gloves. The hands were covered when outdoors, and only taken off when eating or when prompted by the lady of the house whom you were visiting. The gloves should be in muted colors of white, black, or brown. This applies mostly to upper class ladies, as they would not need their hands for the task of cooking or cleaning. At home though, all ladies went without gloves. I prefer my leather riding gloves, but I use cotton and wool as well. Crochet mitts were popular among older ladies, and crochet gloves were used as well. - This is again something for ladies of some wealth. Fair skin was a sign of money, since you could afford to be inside and not work out of the home. A good parasol is made of silk, but there are so many different styles that you really need to do your research in order to find one that is right for you. - Again, a must for ALL ladies. A hat or bonnet helps keep the sun off your face, works to shade your eyes, and covers the hair. 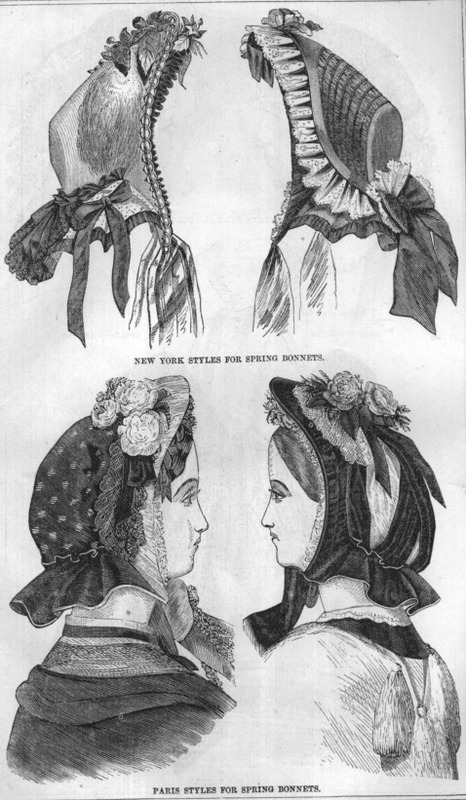 There are many many different styles, but upper class ladies were more likely to have a bonnet that didn’t cover the face, such as a spoon, settler, or fashion bonnet. 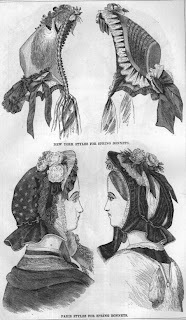 Hats were also a very popular accessory, but were more commonly worn by younger ladies. Whew! And that isn't even all of the things that you can have, but those that are required, at the very least. There are other minor things, such as collars and cuffs, but it's getting a bit late, and this post is getting a bit long. WOW! I didn't realize there were so many pieces involved! Oh my gosh!! I am such a minimalistwhen it comes to clothing, and barely even wear a winter coat..I'd never survive!! Thanks for the very interesting post~! I love it but, oh so much work!! 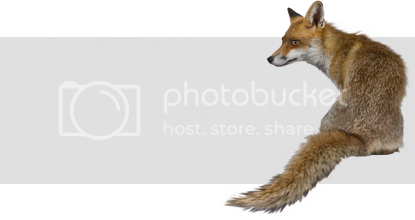 Beautiful Photos and clothes. That would be so fun to wear. Man, how in the world did they ever sit down?? I mean it is very beautiful but it looks very uncomfortable. great review, and here we are complaining when we can't find a great fitting pair of jeans...wow! Sitting takes some practice, lol. You back into the chair and sit. Also, no crossing your legs! Only your ankles could be crossed. Could you imagine how long it took to get dressed, lol. I love things like this from history. That is awesome!!! I love the look! Good piece of post-rich in information! Geesh I didn't know there were 5 layers in all, thought there were just like 3! Soooooo many clothes! That was such a great explanation :D Great writing, thank you for sharing! I learned a lot from reading this, and now I am sure I would have suffered greatly back in the day! Think of all the laundry... by hand... eeek! Hey hun, you have not posted in almost a week, is everything ok? WOW....thanks for sharing...amazing how much clothing they wore. WOW! I loved this. This is great description and explanation. I am sharing with my kids classroom. They just did a paper on this and it was not as descriptive as yours!